Get a life lesson from it. Riding a horse is about combining dynamic, purposeful tension in some parts of your body with relaxation in other areas. Those who have been riding a long time probably don’t even think about it; but it’s something I have to focus on, constantly. Stick with me here. Glance at the photo, and try to picture what I’m going to describe. You could imagine that my body, from the head down, should be an alternating series of mass (lightly held, filled, tense but not bracing) and space (empty, open, relaxed). With all that said, the first thing I see in the picture is that my shoulders are tense and up around my ears. And if you look closely, my horse is mirroring that same tension in his neck and shoulders. Instead of stretching his head down, which allows him to use his muscles efficiently and release endorphins, his head is high, and he is stiff in the equivalent of his upper body. 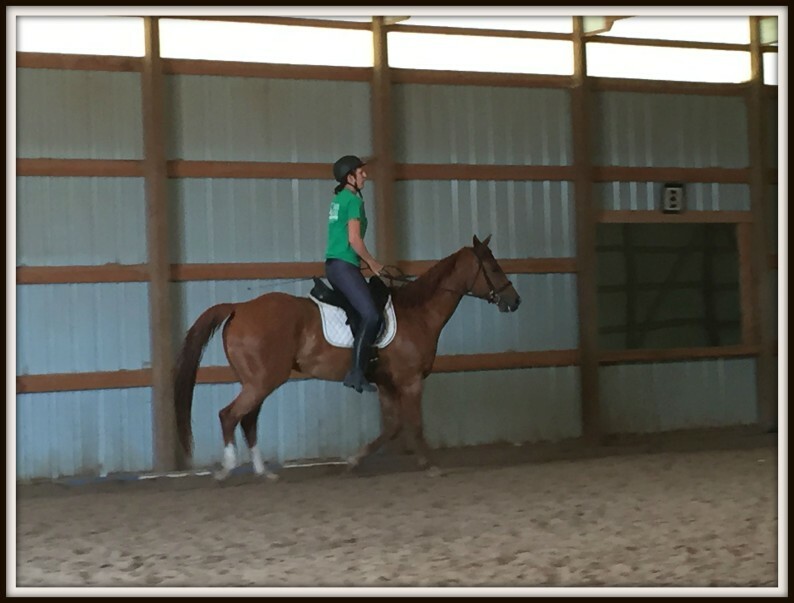 In riding, bracing against the dynamic movement of a horse means I’m stiffening my body in order to support myself or keep from falling. It actually makes everything worse and basically turns me into a ping-pong ball, bouncing around out of control. Not to mention, he braces back in response. In contrast, a purposeful, dynamic tension used correctly allows me to use the push and pull of my muscles to follow his movement, as well as keep myself in place. This encourages him to stay balanced and move forward in a relaxed way. Let’ s just skip over the part where I create a fancy transition for this metaphor. We all know where I’m going here. This is exactly like LIFE. So often, I find myself not only having tension, but actually bracing against circumstances in my life in which I have no control. When we’re driving down the street and I’m losing my mind over someone who is not using his turn signals properly, my daughters says, “Outer circle, mom!” It’s a reminder that bracing against things out of my control only makes me bounce around like that ping pong ball and does nothing to alleviate the problem. These are the areas where I need to be open and relaxed, moving along with life. If I spend a lot of time and energy bracing against the Outer and Middle Circles, I am spinning my wheels. This ends up looking like anger, frustration, and disorganization. I need to focus my effort on the Inner Circle: me, my reactions, my attitude, my choices. I have complete control over those things. When I spend my emotional energy in this circle, I can move along with the rhythm of life, allowing my body and mind to get in sync with what is around me. I hopped up on my horse yesterday, closed my eyes, and allowed him to walk around while I focused on this. I stretched my legs down, allowed my seat bones to move in sync with his movement, taking deep breaths while keeping myself upright through my core and thighs. I thought about all of the circumstances and stressors in my life and placed them, symbolically, in different areas of my body. Relationships with those I love? Placed in my strong core, held in place and balancing me. The upcoming fall schedule? It definitely needs that dynamic tension in the strength of my legs. My kids getting ready to move on and out of my house? That’s one to place in the open, relaxed space of my chest and breathe through, move in sync with it. Some things require my focused attention; others require openness and release. Fighting against any of it makes things worse. It’s all about harnessing the one that’s most helpful. LOVE this, Deb!!!!! Your wisdom helps me with life AND horseys!! Thank you! !